Arrived this afternoon in Linz (Austria) and had a beautiful drive down to Tyrol (also Austria) where we will be staying for the next week in a cabin pretty much on the slopes … to shoot some photographs and get in some snowboarding hours. The entire area is completely covered and the slopes look perfect so it’s bound to be a good one. I’m going to shooting quite a bit of photos here as well as playing with a GoPro so will get some of that stuff up on here soon. 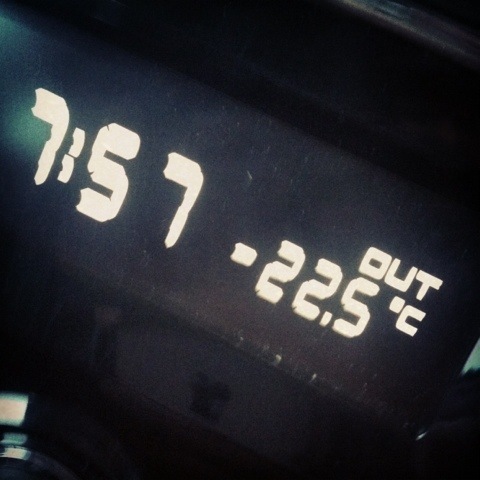 For now … here is a snap of the car temperature gauge (which doesn’t count windchill) just to give you an idea of how cold it is. Hahaha.